Get two spaces for the price of one! It’s great to have a dedicated play space for your kids, but what happens to that room when they are older? Part of good home design includes planning ahead for changes in your family, while making your home functional for you - now. Often times, the Play Room gets relegated to the basement…but let’s be honest. Most of the toys end up traveling right back up the stairs and into every room on the first floor. So, if you can’t beat ‘em, join ‘em! 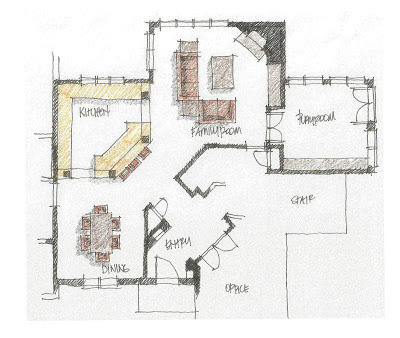 …Why can’t we have a play space on the first floor that converts into something else later? The play room above was designed to be visible from the kitchen, but separate from the family room. This way, the owners can entertain while not needing to move all of the toys out of the room for parties or feeling cluttered all the time. They have a nice, adult space at the end of the day to relax in. This is a more out-of-the-way location than the following two designs. In the future, this room will still make a perfect dining room, study, or sitting room. 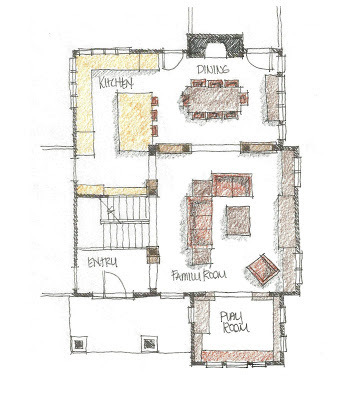 A little more connected to the family room, this play space shown above is still a separate room where the owner can shut the door at the end of the day. It is very visible from the kitchen and family room, but the storage area is still hidden from view. Visibility is a huge part of designing a play room location; parents need to be able to do other things around the house and not always be inside the play area to keep an eye on the kids. Inevitably, the toys are going to migrate to every part of the house, but it’s nice to attempt to create a “home” for them to go back to. In the future, this room will make a great sunroom. 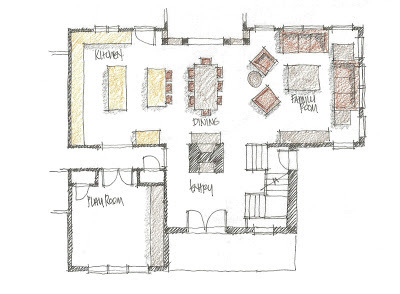 This design shown above is wide open to the family room and is surrounded by built-ins. 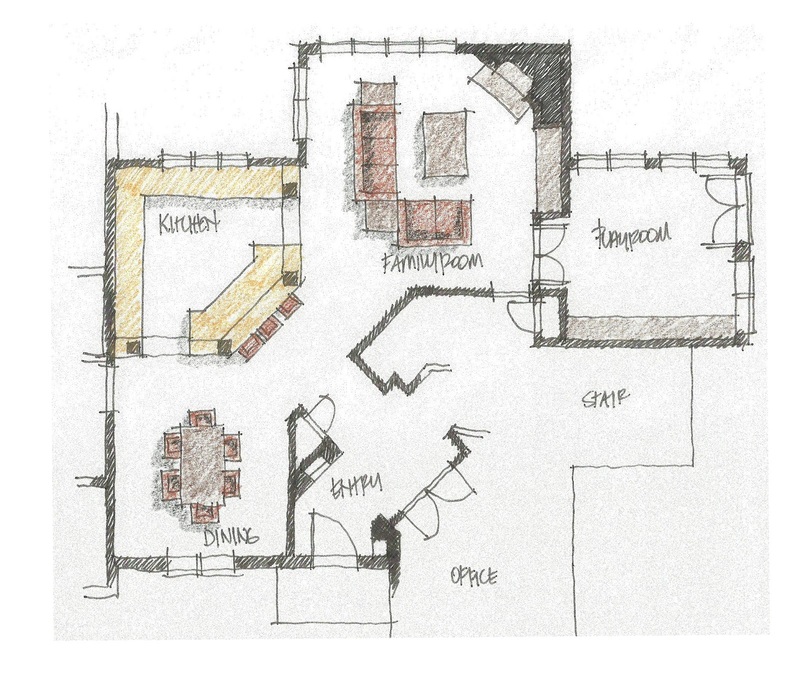 This idea isn’t a new one; it is actually reminiscent of hearth rooms in craftsman homes of the early 1900’s. Except, the hearth room was for sitting by a fire and this is for a more modern, every-day use. This allows the play room to be visible from the kitchen, dining room, and family room all at once. However, it is not visible from the front door as soon as you walk in, either! Down the road, it will be perfect for a small sitting room, office, or craft room. So, if you are designing your home for long-term use, think about the reality of how the spaces will be used – now and in the future. We all like to think that all of the toys will be neatly put away and we can contain the mess. The truth is that this is not going to be the case; even for the most organized families! We can, however, mitigate the mess and clutter; or at least, how often we see it! …and at the end of the day, you will have a convertible, flexible room that can be used for other purposes; not just abandoned.